If you’ve not been here before a very warm Christmassy welcome to you and thanks for calling by. Although a company dedicated to the ongoing airworthiness and maintenance of hot air balloons we do have other rather bizarre and varied interests which you will find dotted about in the form of articles or lurking in the news. We have had a very troubled couple of years trying to engage HS2 and stay in the workshop and thanks to our local MP David Lidington and his assistant Kieran Sinclair and some very hard work by our new land agent Jamie Willis we are still here. Yippee. Well what can we say apart from a huge thankyou to all of you and a very big thankyou so very much for your custom and support this past year especially with regards to our hard fought battle to stay at Hartley Farm. We have a lot to do in the coming year and some more hard decisions to make but we are still here and still have a workshop that works for us and hopefully you. Thank you all again. 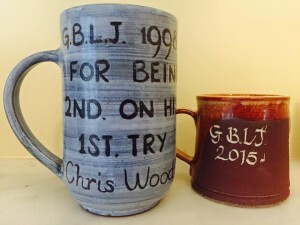 This year meant a very sad farewell to Chris Woods. Somewhat brilliantly and somewhat in honour of his dad his son Wills entered the Long Jump with Stephanie Bareford and came a very respectable second, repeating his dad’s first attempt. Put nicely by Wills, ‘Pretty pleased to mimic my Dad's efforts 17 years later! He flew with Barry 187 miles in 7hrs 30 mins from Oswestry to Denton in Norfolk. Stephanie and I flew 208 miles in 10 hours and 5 mins from Parham in Norfolk to Nant-Ddu in S. Wales. Next year we go for the win!’ We also said goodbye to Gus the Dog, although we don’t miss tripping over him, and to Alice who is now working for a local accountant and getting married (at last) next year. On the technical side of things there are a number of EASA/CAA matters that are in the pot and clearly not going away. Let us hope the outcome of all the negotiations (very refrained wording don’t you think?) by those in the frame and who put a lot of time and effort into the causes various come, if not to fruition but result in a much more clearly defined set of rules and regulations for balloonists. Although we have again seen quite a few retire from the sport and the the business there have been some signs that all is not doom and gloom and if the re-invigorated Chiltern Region is anything to go by plus the enthusiasm and incredible achievements of the young entries in this years Long Jump things could well be on the up, even Camerons have finally realised the future is light! Now who would have thought that? We will be out and about a lot more next year. Didn’t happen as planned this year on account of HS2 and things various. Saddest missed meet must have been the Lake District but hopefully that will run again. Not sure at the moment if we will make the New Icicle as it falls a tad early but if we get the chance to call by we will and will look forward to catching up with some of you there. This months’ news is rather CAA/EASA Ride Balloon/Declaration/BOC dominated I’m afraid but we have found a few other off the wall items that may be of interest. Articles this time include a piece on Warstein by Neil Iveson who trotted off there in the company of Maxwell House plus a rather nice piece that echoes our thoughts by Steve Roake (apologies to him for still not finishing the Lindstrand Hopper piece which we will share, but we will honest), Robin Batches’ Long Jump summary (should be up), hopefully our day out to Malmesbury and the tale of the Tiger (coming soon) along with a nice piece from Kim Hull (who would believe it) on his really super smashing flight over Buckingham Palace. There is probably a bit more catching up to do so article-wise so we’ll get something out in the New Year. On the horsey front Team Wellick have had a great year and Sue the Lorry has performed very well only loosing a couple of tack locker doors to hedges various. She is due her annual test in January so that will take up a day or two. Great results for Treasure the Pony but in the final count up of points accrued in the Leighton Buzzard and Stanbridge Riding Club events they cleaned up most of the silverware. 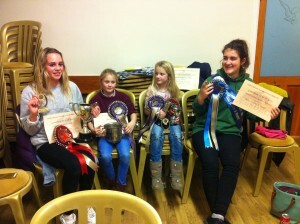 Pictured here with champion cups and rosettes from the presentation are left to right Emily Clarke, Holly and Nicole How and Miriam Holland. Well done to them. Over in the dark barn it is now very empty. What a fine thing having the thought that you may have to evacuate at short notice is! All we have left now are the two original Standards and a gaggle of bikes including, for a short while, Cousin Pete’s BMW, fondly known as 'The Kaiser'. Everything else has been sold which, of course means we can start again and have as it happens! More next time. What we did find was that we had spares for loads of Old & Rusty stuff that we had long ago forgotten about but have now sent off to new homes courtesy of eBay and friends we know could, and will, use it. Should have had a monumental clear-out years ago! Actually this spread to the workshop and visitors will now note the absence of quite a few balloons from the shelves. We even got Mark Shem to pick up his old Airchair frame for which he now intends building an envelope for. Nice one. Another first this year was buying a Christmas Tree, a jolly fine six footer from Wickes for £19.99 so no scrambling across fields in the dark armed with a saw this time round. Small people came and threw decorations at it and very fine it looks to. Picture of the year came in at the last minute from Rob Cross. Being a true Old&Rusty he went to see Duchess of Sutherland running north through Luton. 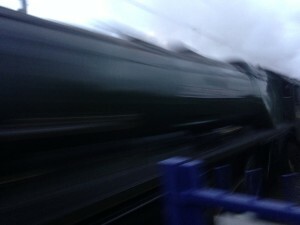 He mailed, ‘Got the see the great loco this morning and the attached image was the best I could get as I was simply too close! There was I used to watching steam trains pootle slowly up preserved branch lines, but I've never seen a steam loco going at full belt down a main line - completely awesome - she must have been doing 80-90mph! She was towing 10? carriages plus a Class 47 'Brush 4' in two tone green which brought back spotting memories from the early 70s.’ Just smashing matey, love it. Well that’s about it for 2015 and what a great ending. Just remains to thank you all again so from John, Jane, Alice and me and mine dog Dotty, wish you all a very, very Happy Christmas and smashing super New Year. Thanks for calling by here’s to you, Cheers me dears.